O.T. Ghost Overtime continues the story from film O.T. in the omnibus 3AM. After being spooked by the ghosts in their office, Karan (Shahkrit Yamnarm) and Tee (Ray Macdonald) have made it out alive, though they now suffered hallucination and paranoia. They can’t use the elevator, and they have to constantly checking if the person standing next to them is actually a human and not a ghost. But still, the two bosses still play ghost-pranks on their employees. This time, they’re joined by a new partner Badin (Ananda Everingham). They tease and spook the staff who stay late in the evening to claim overtime. But things always get spookier late at night in this unusual company. This time, together they will have to rescue the company from a critical condition while experience unexpected events in their own office. Their staff who loves working overtime will be part of this misadventure. If you are scared of horror films and hate all the scary effects, this is probably the next best film after Mario Maurer’s Pee Mak. The horror-o-meter of this film went from 3/5 down to 0.5/5 as the plot developed, realising that those ghosts were all pranks by the bosses. The two main lead Badin (Ananda Everingham) and Tee (Ray Macdonald) looked similar in some sense and I often have to recall their personalities to differentiate them. They were great actors (or should I say pranksters) who had to prank and be pranked and most importantly, act like they are being pranked, something that is difficult for guys to express their fear without look like a wimp. The two girls above had a stake in the ghost-acting initially, but “died” due to an accident. There were so many fake death pranks that I didn’t know if they were really dead in the end, or was it just another prank of theirs. The film did not show if they are truly dead (or maybe they were camouflaged amongst the bunch of workers who assisted in their pranks?) which was a pity, given that the nerdy lecher actually performed lewd acts on their “bodies”. The one who caught my attention was the eye-candy “antagonist” Akarat Nimitchai, who looked like a combination of Brunei’s Wu Chun and Singapore’s model-actor Leon Jay Williams and his super pretty on-screen fiancée. He was the psychotic and overly-jealous rich guy who seemed to be bent on driving the main leads crazy. My initial thought about both of them was how both of them were a little awkward and stiff with their acting, but it all make sense later one as the plot unveil and show why they acted that way. Not to forget the comedic character, nerdy-looking-on-the-outside but timid lecher-in-reel life who craved for the attention of the pretty girls in the company. He was definitely one of the more irritating but hilarious one, doing weird stuff like masturbating while peeping at his co-workers, and being enticed by pretty ghosts etc. This is definitely a film for laughters than for scares. I was able to look at the ghost in the face without cringing too much, so fret not and watch away! To make it more fun, try spotting which of the incidents were real and which were not! The director, Isara Nadee is a director and actor, known for Art of the Devil 2 (2005), Long khong 2 (2008) and 407 Dark Flight 3D (2012). Check out O.T GHOST OVERTIME (加班遇到鬼)’s Five Star Production website Official Website. 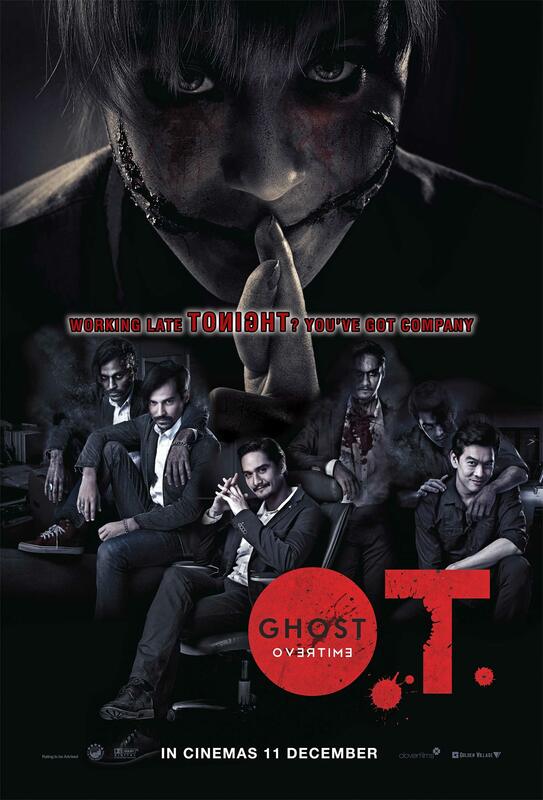 O.T GHOST OVERTIME (加班遇到鬼) is out in cinemas on 11 December 2014.
just saw it last night. Very funny. must watch!! You know how much I love horror flicks… Not! Don’t they give you nightmares? At least, this one has an interesting storyline and you do a great job with your reviews. That eye-candy actor is really cute. 😉 Haha! I am not a big fan of horror movies… I have after effects for days. Totally agree. This movie is purely talk bird language. Not a fan of thriller or horror movie so I’ll just skip this :/ Great review anyway! Oh man, I am not so sure this is the movie for me, LOL. That first photo was super creeyp! I’m a timid person to watch ghosty movie… But your review looks nice… with handsome actor + pretty actress! I would like to watch the movie because of the male actors who look very handsome and sweet but in general I prefer really spooky ghost movies that scare the hell out of me, pranksters are just for fun, anyways a great review again! It’s nice that there are a lot of comedic moments too. They are just welcome breathers on screamfest movies like this. I am fan of this kind of movie horror-comedy film because makes me laugh and have this scary moments as well 😀 this particular movie looks interesting! ! I am definitely gonna watch it! Based on your review, I wouldn’t want to watch something I would be confused of whether something is really happening or its just some prank. I would personally want a straight scary movie or a direct funny one. Looking at the poster, it was very interesting and would expect it to be hell scary and I will definitely be disappointed if I watch and find out it’s not as much as I expect it. Yes, it’s not as scary as I thought, although the trailer says otherwise! what, so the bosses pranked them? never a fan of horror movie… and one with such an anti-climax ending will all the more not enter my to watch list. haha! Hi Mia, the ending is definitely NOT anti-climax as there wasn’t any time for you to feel anti-climax when the next incident happen! It seems like it’s a Friday night with no plans kind of movie hehe. Sounds like a real fun movie to watch. I don’t watch too many horror movies because I get really spooked but judging from what I’ve read, this looks like something I can really enjoy. Oh my gosh! I watched the trailer and got goosebumps!!! I want this movie! I was cursing and screaming already just watching the trailer! Lol..